The Idea Hive classroom is almost out for the summer. But just before the year ends, the students had, as one of them described, the “opportunity of a lifetime” – a Skype visit from the award-winning author of The Book Thief, Markus Zusak. Clarence and I have written about the Idea Hive class activities surrounding The Book Thief in previous posts. The story is set in the fictional town of Molching, Germany during WW II. It’s a beautifully written story of a young girl’s relationship with her new foster parents and neighbours. Narrated by “Death”, it’s full of humour and heartbreak. A few of my favourite passages..
As Liesel attempts to explain the reason for her first stolen book to Hans, her foster father: The soft-spoken words fell off the side of the bed, emptying to the floor like powder. The scene where Liesel intrudes upon her step-mother, Rosa, as she cradles her husband’s accordion after he’s sent to war. Mama was snoring again. Who needs bellows, she thought, when you’ve got a pair of lungs like that? And of course, the last quote from “Death”: I am haunted by humans. 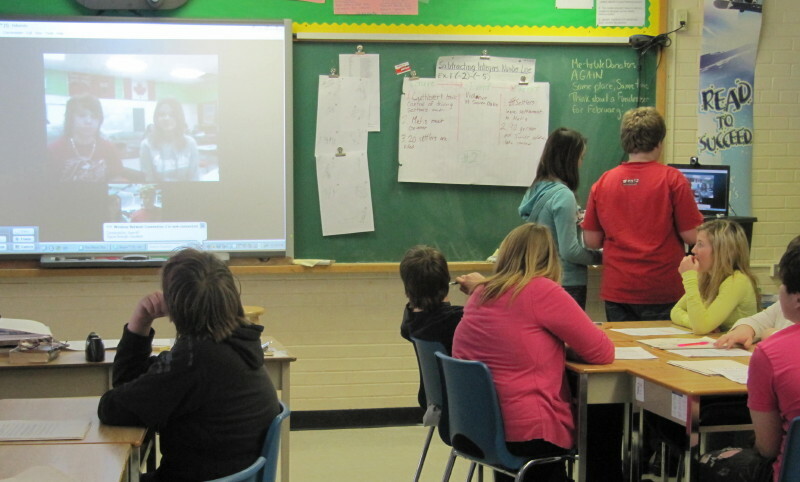 Our classrooms connected via skype almost daily as Clarence and I read the story aloud to our students. While one teacher read, the other was in the TodaysMeet backchannel room, helping students as we answered questions or posting compelling phrases. After the book was finished, the students wrote their first book, A Field Guide to Molching, which is inspired by the characters and events in The Book Thief. 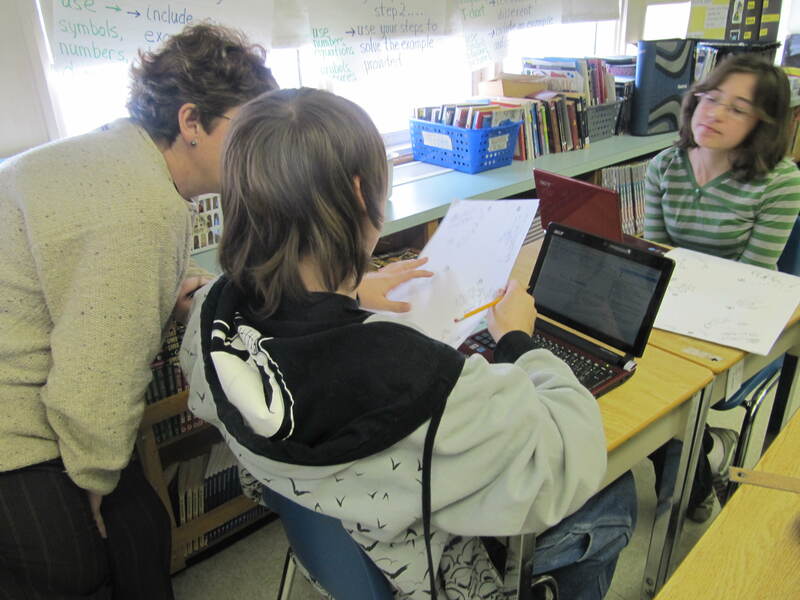 Using Google Docs, and working in groups of 4 (2 from Manitoba, 2 from Ontario) the students came up with the topics that should be included before moving into this two month project. 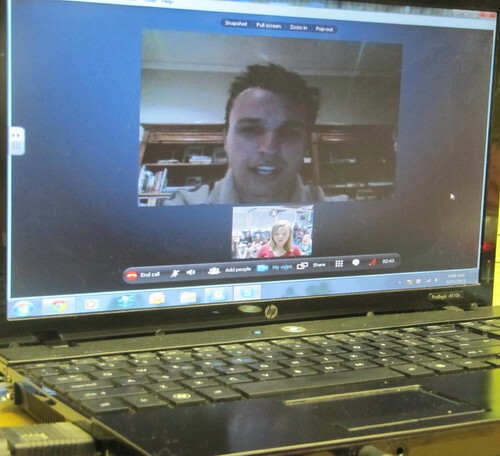 After presenting the books to our students, we contacted Markus Zusak, from Sydney, Australia, who graciously agreed to a group skype call with our students. It took some planning, as we all live in different time zones. So with a willingness to make it work for everyone, Markus agreed to an 11:00 p.m. call, while Clarence’s students in Snow Lake agreed to come to school an hour earlier. Each class had previously prepared questions, and two students from each classroom wrote as the event unfolded in the TodaysMeet chat room. Unfortunately for Clarence’s students, skype was not connecting that morning for them. As we got started, we assumed Clarence and the students in Snow Lake would be joining in shortly. But when we got towards the end of the call and still no Snow Lake, I had some of my students ask the questions that Clarence’s students had planned. One of my students had videotaped most of what was happening in the classroom in three sections. I was able to upload the first section, which was under 300 MB in size, and share it with Clarence via Dropbox. Not so easy with the next two sections which were over 357 and 959 MB. Even the Dropbox upgrade still wouldn’t allow those size of files. My call for help on Twitter was answered by my son’s friend, who recommended sending the large files through Mediafire. Thank-you James! Luckily, the audio quality from the videotaped files was clear, so the Snow Lake students could hear the discussion. Markus spoke very openly as he answered many questions from the students, including one on what it takes to gain success as a writer. His philosophy on the value of failure and making priorities could apply to many goals in life. 1) Embrace failure. It means you will grow as a writer. 2) Make writing a priority. You need to enjoy that time alone and being alone with your characters. After reciting the opening to his new book, Markus asked the students about their next publication. While they didn’t have a specific answer, the students hope to publish another book next year as our classrooms continue working together in the Idea Hive. Our soon-to-be grade 8 students already have a solid foundation to build upon. While not without its share of struggles, our goal of creating a connected classroom has changed how our students learn. They value the fact that “we learn better together”. They’ve learned that the definition of “teacher” has moved beyond being just the one in their classroom. In their connected classroom, “teacher” can be anyone in the world, including Mr. Fisher in the chat room or even an award-winning author of a beloved book. As the students move towards the end of this year’s collaboration in the Idea Hive, Clarence and I presented our students with the book they wrote together, while living 2 700 km apart. A Field Guide to Molching came into being after we read aloud, via Skype, Markus Zusak’s novel, The Book Thief. Set in the fictional town of Molching, Germany during Hitler’s reign, it’s the story of a little girl’s relationship with her foster parents, friends and neighbours. Filled with humour and heartbreak, the story is told from Death’s point of view. It opens with a train headed for Molching, the death of Liesel’s brother and a track-side funeral. We knew our students would fall in love with the characters. They did. At the end of the story, the students didn’t want to leave Liesel, Rudy, Max, Rosa, Hans, and Frau Holtzafel – they were connected. Clarence and I chronicled the journey throughout the year. So what if we traveled to the fictional town of Molching? What would “A Field Guide to Molching” look like? To help them visualize it, Clarence and I showed our students online travel guides. They determined the most relevant people, places and events to write about if touring this town. Using Google Docs and its chat room, students signed up for the writing topic of their choice in a google doc. Clarence and I dropped in and out of each chat room doc to give feedback and advice if needed. When we needed advice on the use of images from that era, Rodd Lucier (@thecleversheep) provided guidance. As a final step, the 84 page document was uploaded and published at Lulu.com. By the end of this event, students had learned much about the arduous writing process. I was reminded of the line, “The sum of the whole is greater than its parts.” That’s the big picture. It’s not about marks or report cards. 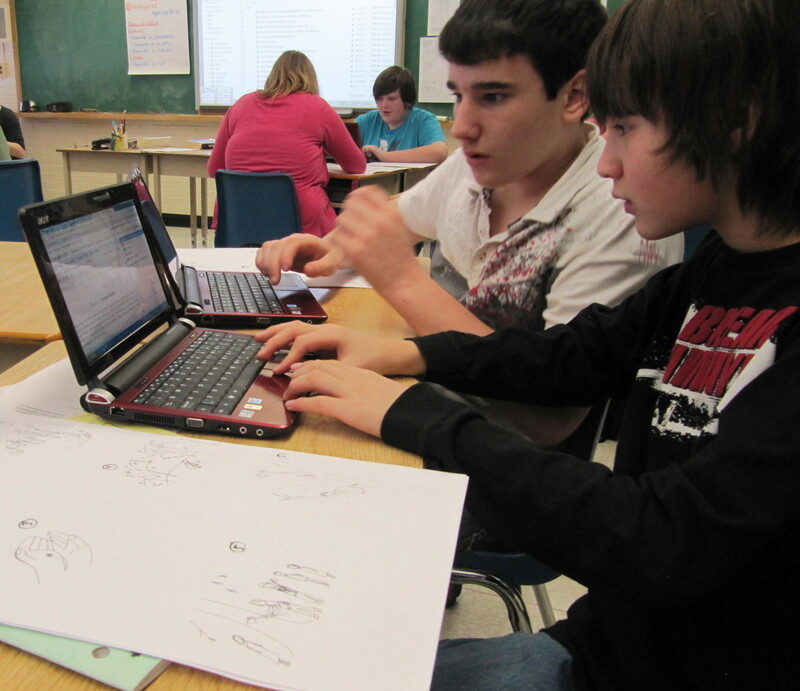 It’s about helping students develop their collaborative learning and shared writing skills. It’s that simple, and that complex. 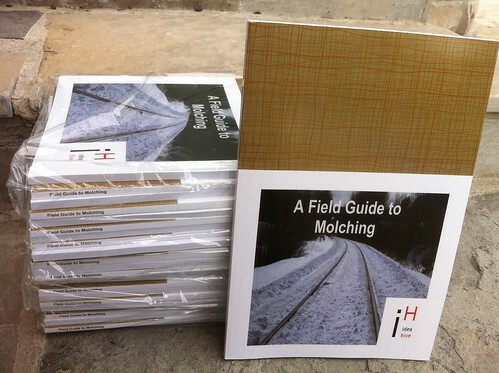 This week students were presented with the hard copy of “A Field Guide to Molching”. While Clarence and I had planned to Skype during the presentation, Skype had other plans (not) and it wasn’t meant to be. So with our Twitter connection, Clarence and I decided to go ahead. Even though we had told the the students this was the goal, their shock and joy was evident. After receiving their books, students posted their reactions on a web 2.0 tool they’ve become quite comfortable with – linoit. Many of the comments posted focused on how proud the students are of their work and how much they enjoyed writing together with new friends living so far apart. I feel like an author and it feels good. We should have this book published. I bet people would buy it when they buy the real book to get to know about the town Liesel lives in. Tanner M.
If I was ever given the chance to read that book again I would never let it down. Justin S.
Sully, right back at you! This has been one of the best teaching experiences that I’ve had the pleasure of being involved in. 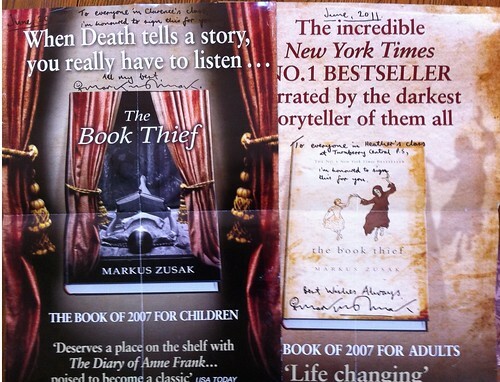 Clarence and I have shared this story with Markus Zusak through his Twitter and Facebook account. With any luck, the Idea Hive student authors will hear from the author who inspired them. The Idea Hive recently created their own “liquid network” in a shared writing project. 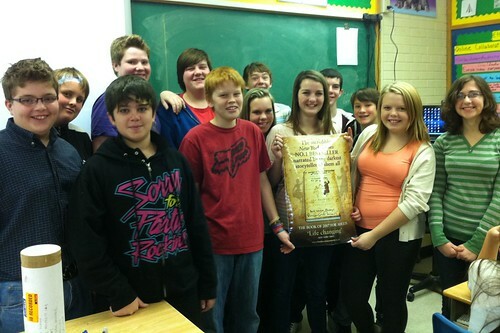 The Idea Hive is a year-long collaboration connecting Clarence Fisher’s students in Snow Lake, Manitoba with my students in Wingham, Ontario. In previous posts, we’ve described the Skyped read aloud, backchannel and virtual bulletin board process that connects us daily as we journey through the novel, The Book Thief. At this point, we’ve reached the story within the novel called “The Word Shaker”. 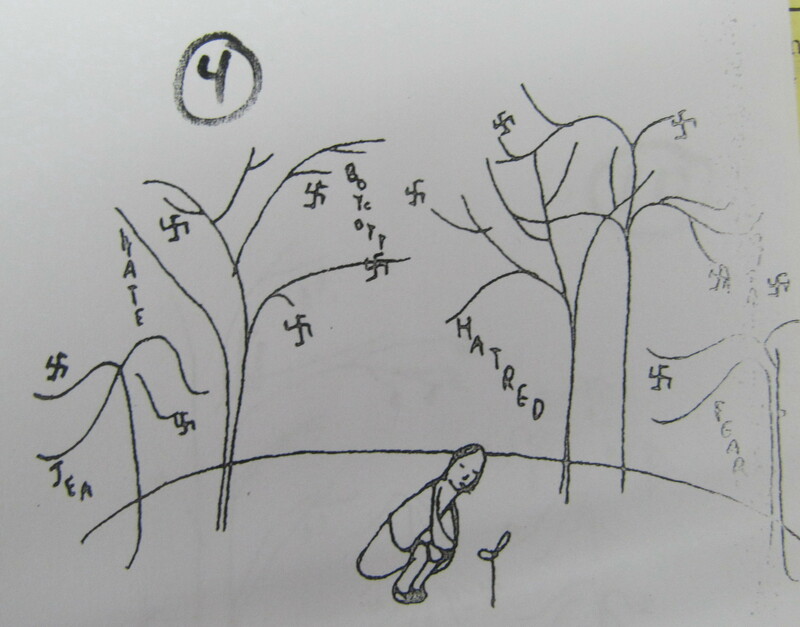 This illustrated fable is written and presented by the Jewish character Max, to the young German protagonist, Liesel. The story mirrors the use of propaganda by Hitler. In Max’s story, a young girl (“the Word Shaker”) is encouraged to fight words of hatred with words of love. After being given copies of the 11 images only from the fable (no text), students in the Idea Hive were asked to work together to predict the story Max had written. Each group (2 students from Ontario, 2 from Manitoba) used a shared Google doc and the sidebar chatroom to communicate and create their story. During the 45-minute work periods, the room was completely silent as students participated in their group’s chat room, formulating plans to be transferred by the agreed-upon “recorder” into the document. After the first work period, Clarence and I each had a discussion with our own students about the process. Students loved the high rate of participation by most group members. They engaged in debate, synthesis and cooperation. They had fun. Frustrations due to technical troubles were similar at both ends. This highlighted the fact that collaborative skills (inclusion, wait time) were even more important when working only with text. Avery is excited and proud to tell the principal about the shared writing activity he's working on in the Idea Hive with his partner here in Ontario and two others in Manitoba. The students’ level of engagement in the following days spoke for itself. The silence in the classrooms continued as students actively “chatted” in their groups. On day three and four, students who were home sick joined their group online in order to participate in the project. As students wrote, Clarence and I dropped in and out of the 11 chat rooms, offering quick suggestions or asking a few questions. 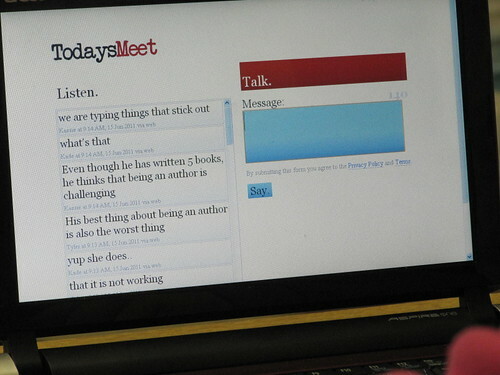 We watched the story document develop while the brainstorming and discussion carried on in the chat room sidebar. Clarence’s description – “mesmerizing”. Once the groups finished writing their interpretation of Max’s story, the groups presented together some of their images via Skype to the Idea Hive class, then posted their finished work on their blogs (click on student names below to view group stories). 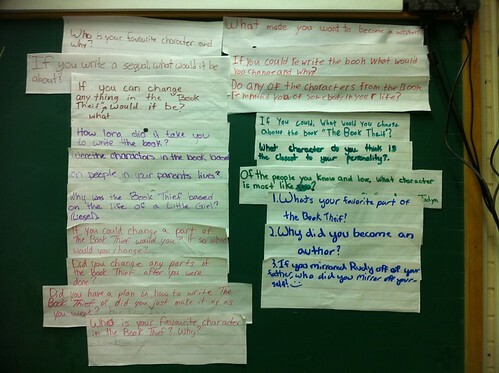 So, other than creating a story, what did the students learn? While chatting with others via computer, I learned…. These students have learned lessons far beyond those outlined in the curriculum. They are displaying skills that any 21st century employer seeks. Innovation often happens in unlikely, unpredictable ways. Creating opportunities for our students to learn in this “liquid network” help to lead our students in completely different pathways they’d never thought of. Across 2 700 km, students used the power of words to collaboratively developed an understanding of the importance of words. In a text-only collaborative process, they themselves became “The Word Shakers”.